"A delicious slow cooker chili with so many spices and so much flavor!!" Place a large skillet over medium-high heat. Cook the ground beef in the hot skillet until completely browned, 7 to 10 minutes; drain. 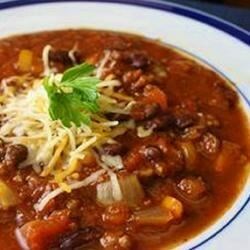 Combine the drained beef in a slow cooker with the bell peppers, onions, kidney beans, black beans, tomato sauce, and diced tomatoes. Cook on High for 30 minutes. Stir the garlic, chili powder, paprika, oregano, rosemary, coriander, garlic powder, salt, cumin, cilantro, and bay leaves into the beef mixture. Reduce heat to Low and cook another 6 1/2 hours. Try this easy, hot, and spicy chili recipe. I was very underwhelmed with flavor of this. It was fine but nothing special. I needed an additional 15oz can of tomato sauce and also added some Franks Red Hot. Hubby loved it, so all is good! Thanks for sharing!